Mammoths spawn in a new biome, called the Frost Plain. 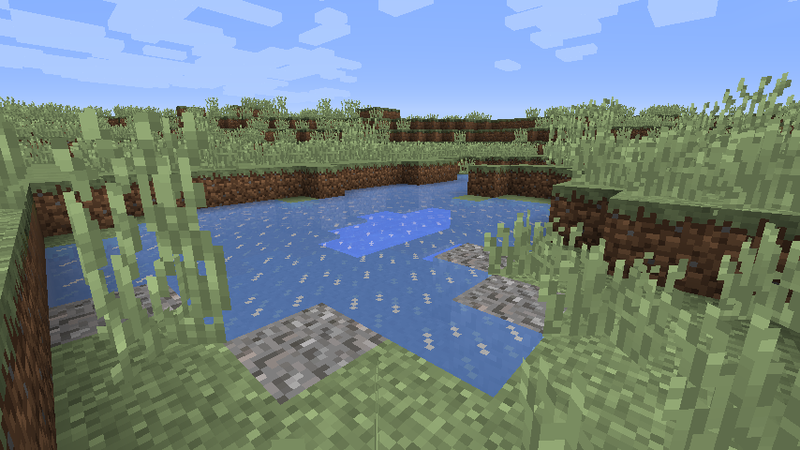 This biome is similar to a plains biome, but has very light grass, to make it seem frosty. It has no weather. Ice spawns in the biome, but not snow.There is an occasional spruce tree. Flowers do not spawn. Wolves and sheep can spawn here, but other creatures do not. Hostile spawning is normal. The biome is a bit more common than a mesa. Mammoths could look like this. Mammoths spawn in groups of 2-6. You will be lucky to find 3 "herds" in a biome, but at least one herd is common. The have 40 hearts (4 times as much as Steve?) Mammoths do not trust humans, so stay away from you, unless you are holding a hay bale. They attack anything that attacks it, or another mammoth, by swinging their head, and hitting you with their tusks, which does 3 hearts of damage, and huge knockback, that will get you far enough away from them that you can get away without further damage if you want to. Mammoths can be tamed with Hay bales, but require a minimum of 5, and a maximum of 10. Once tamed, they will act like a horse. They won't move away from you, and have special taming features. Like horses, they can be saddled, and ridden, but they only autowalk up blocks, and can't jump. They are also slightly slower than the player. When the mammoth has multiple saddles, multiple people can ride it. The person on the front saddle is the driver, he can't use any items, but he can click to make the mammoth attack. The people on the 2 other saddles can look around, and use bows to attack enemies. You get into the seat that is free, and closest to the front. You can use space while riding a mammoth to switch to a seat further back from yourself. The banner appears in between the 2 passengers, and the standalone chest goes behind them. When the pilot presses E, he will go to the mammoth's inventory, while the passengers will look at their own. 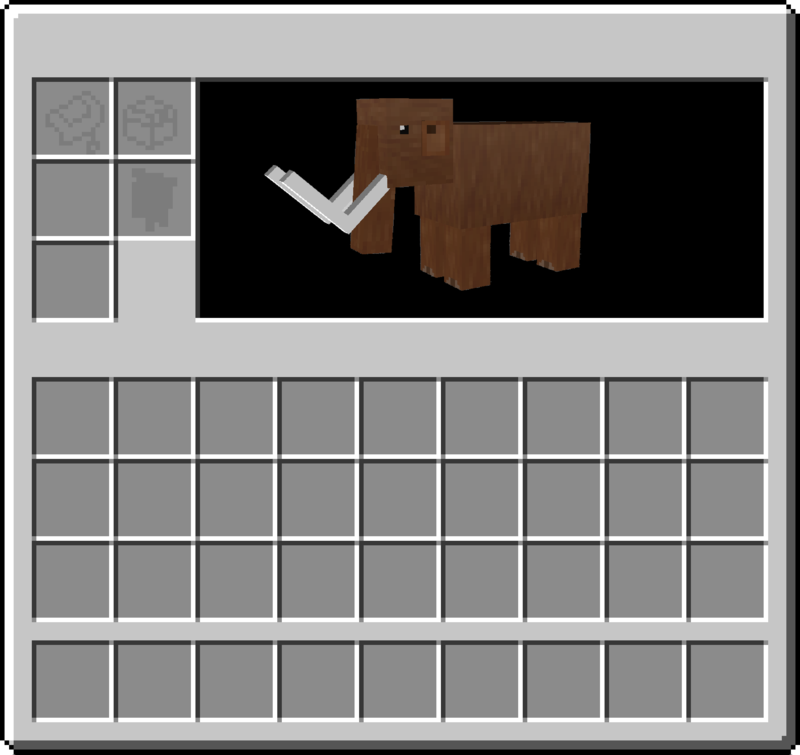 The mammoth tusk can be crafted into 2 ivory powder, which looks similar to bonemeal. This can be brewed into a strength potion. Strength I lasts for 1 minute, and strength II lasts for 2 minutes. It can also be crafted into a Horn, which when right clicked with makes a loud trumpet-like sound. Mammoth wool can be used to craft armour for wolves. It adds the equivalent of 5 armour bars (10 armour points) to the wolves. 4 mammoth wool can be crafted into 4 brown wool. Mammoth wool is an item, not a block. Q: Why a new biome? A: No current biome fits the habitat, of the mammoth, and I don't want them spawning as commonly as normal mobs. Q: Minecraft is set in medieval times! Why are there mammoths? A: Minecraft isn't medieval, but if your mind is set: Mammoths went extinct during medieval times. So it makes perfect sense. Q: Minecraft is set in the future after a nuclear war destroyed everything! Q: This will be hard to code! A: Ask yourself this question: Do I have any knowledge of the Java programming language, or any similar tool for creating programs on a computer? If the answer is no, then you don't actually know if it is or not. If the answer is yes, then remember than Microsoft owns Mojang now. They probably have extra resources. Q: This will cause lag! A: Yes, it will cause lag. A very small, minuscule, tiny amount of lag. Q: Where is your awesome concept art we normally get in you suggestions? A: I'm busy. It'll be here soon. Thank you for reading my suggestion. If you don't like it, don't just say: "No support" Give me a reason like: "I don't like the trees, No Support." So that I can improve the suggestion. Anyways this is an interesting idea!I see you really put some good thought into it!And it would also be a pretty cool thing that you could use banners for other then display so yeah. Full Support! Also I can't really think of what it would be used for as of now but an interesting idea for a drop could be its tusk. Well while it doesn't have a specific name,I heard that Elephant meat is sometimes called "Bushmeat",so it could probably go along with what Mammoth meat would be called as well. I know right? All I ever see is 4 lined suggestions of either OP things, unbalanced things or just ridiculous things. I have a history of detailed suggestions. Bottom question in the "Q"TWPBF"A"
We don't really need another meat. Tusks is the obvious answer, but what do you use a mammoth tusk for? Musical instruments? Well Jeb has already said that no moe armor or tool tiers are planned and that's the only thing I can think of. So, I'm kinda outta ideas here, sorry. I'm going to make some concept art now. Lets just say there will be less words. Also, if you want to see another one of my suggestions, my third banner in my signature is one. So I could drive the mammoth with a soldier raining arrows from a passenger seat as a war banner flaps in the breeze as hundreds of dead pile against us? Added concept art of the Mammoth, and Gui! I like it. It's balanced. It's not good for transport but good for charging into player/zombie hordes and defending villages. It has 40 hearts so the same as the much smaller Elder Guardians. I suggest that the tusks can be used as decorations and can be placed on the roof, the wall and the ceiling. When placed on the wall can be rotated by right-clicking (like item frames). When placed on the roof or ceiling, rotation can be achieved in a similar manner as signs and heads. My base would look way cooler with horns (or tusks) on the battlements. They also may drop a great deal of meat (considering they were hunted by humans.). What do you think? Can it stomp? Deal damage by walking over tiny imbeciles? Where would the banners display on the mammoth? The sides? With the additional two slots, does it mean you can have three saddles or three chests? Cool also I just took a look at it and would you mind telling me how you make that art? Tusks could be used to craft new Arrows (replace Flint in the Arrow recipe with Tusk, you'll get 4 Tusk Arrows), those are stronger and have increased knockback, great for the archers riding the Mammoth, it could also be used to craft a Battle Horn, used to make a frightening sound before charging into the enemy lines. The problem about the tusks being used for decoration is their size. They would take at least a 3 by 2 block area when placed. Imo too many mobs drop meat, but I'll do something with the meat idea. It would be 3-4 blocks tall. Probably not. I don't want it too powerful. The banner currently appears between the 2 passengers, but it probably would be more visible on the sides. You can have either. The 2 blank slots can hold a chest, or a saddle. 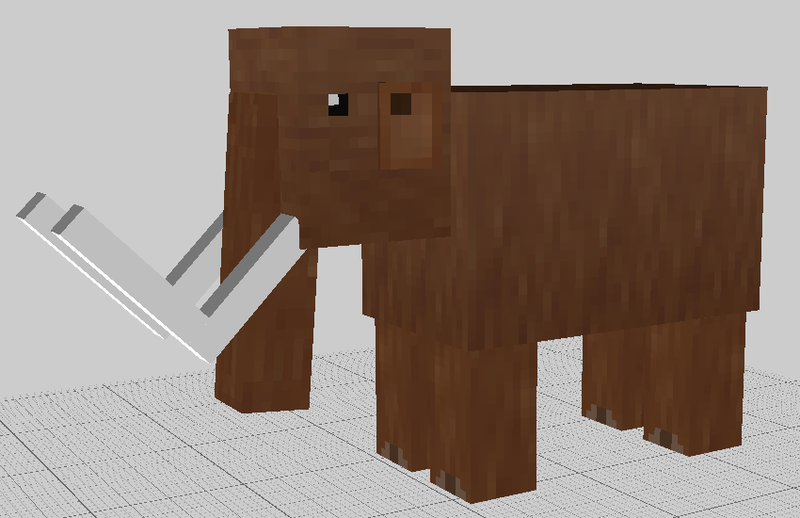 I used tabula to make the mammoth model, paint.net to texture it. To make the gui I just edited the horse GUI. Wolf armour is an interesting idea. The problem with tusk arrows is that the arrows we have already can be as powerful as a diamond sword (without enchantments), so this, when combined with enchantments could be OP. And I don't think designing a system on choosing arrows to fire is going to be very easy. I like the battle horn. I'll probably add that.